An article published in the New Yorker magazine last year set out the intriguing theory that invasive species such as beavers in Tierra del Fuego or Japanese knotweed in English gardens provided a clue to a new approach to cancer. One that doesn’t depend on carpet bombing tumours but on ensuring that the territory being invaded by metastasising cancer cells is made as inhospitable to the new arrival as possible. The agonisingly slow rate of improvement in the survival of patients with metastasised cancer despite the expenditure of billions, suggests a new approach is badly needed. Although Mukherjee doesn’t talk about it, one of the best candidates for making our internal territory inhospitable to cancer is the ketogenic diet, which works by cutting the amount of the glucose in the blood. Cancer cells need very high levels to grow. Known as the metabolic theory of cancer it is of great interest to patients but is still largely dismissed by the cancer mainstream on the grounds that it lacks evidence. However, getting evidence may be about to change thanks to a couple of recent breakthroughs which suggest two new approaches. Research has been going on at Oxford into the ketones that the body makes in response to a large reduction in carbohydrates. They have created synthetic ketones which would make running tests on their beneficial effects on metabolic disorders such as diabetes and cancer much easier (covered later). Then last month a London clinic reported some remarkable results from a trial of a cocktail of four old, off-patent drugs on almost a100 brain cancer patients. These relate to the metabolic theory of cancer because the drugs all target various ways in which cancer cells use their main energy supply – sugar. Average survival time for such patients treated with the standard approach of chemotherapy and radiotherapy is 14 months, as it has been for 20 years. The patients treated at the clinic, all of whom had also had the standard treatment, survived for an average of 27 months. An unheard of improvement. For more details see my Daily Mail article. Diet make a difference to cancer or not? 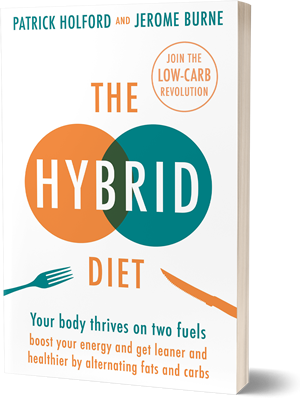 The main charity Cancer Research UK has described the idea that patients would benefit from reducing the intake sugar and refined carbohydrates with a ketogenic diet as a myth. Yet at the same time it advises that lifestyle changes – such as cutting alcohol consumption and losing weight – could cut the incidence of cancer by 40%. There is clearly confusion over whether ensuring your internal ecology is cancer inhospitable makes sense or not. The diabetes drug metformin provides an interesting bridge between the pharmacological and the lifestyle approach to cancer, highlighting this confusion. The drug works by reducing the amount of glucose and insulin in the blood, helps with weight loss and brings down blood pressure. These are the same effects that a ketogenic diet produces. However, for the last twenty years metformin has been researched as a potential anti-cancer drug following observations that diabetics, who are at a raised risk for cancer, had a reduced risk if they had been treated with metformin. Sorting out this confusion over the role of lifestyle and possible benefits of making changes to the metabolic system is increasingly urgent because there are now serious, behind the scenes, doubts about the theory, usually presented as a fact, the cancer is the result of random genetic mutations. It’s an idea that has been challenged by, among other senior figures, co-discoverer of DNA James Watson (see below). The implication is that something else is going on and evidence is growing that it involves the metabolic system – how your body makes and uses energy. It seems increasingly likely that researchers have been looking in the wrong place. Genes do play a part, but they are far from the whole story. Clues that something is amiss actually date back 30 years. If cancer is ruled by genes, then putting the nucleus (DNA) from a cancerous cell into a healthy one should turn it cancerous. But it doesn’t. However, if you implant the healthy DNA plus damaged mitochondria (these are the miniature power plants found in almost every cell in the body which makes all your energy from glucose and oxygen,) then the cell does turn cancerous. That not only suggests that DNA is not running the show but that the mitochondria are heavily involved, which fits with another fact about cancer, usually ignored, that cancer cells frequently have damaged or poorly functioning mitochondria. That means they means they make their energy in a different way to healthy cells. More on that later, along with more on why genes are very unlikely the be the whole or even the main story. A pioneering researcher who some years ago started looking for the factors controlling cancer outside the cell itself is Professor Mina Bissell, a leading authority on breast cancer at the University of California, where she is Distinguished Scientist with Lawrence Berkeley National Laboratory’s Life Sciences Division. Her big idea was that focusing exclusively on genes as the cause of cancer was to miss the wood for the trees. The mutation theory doesn’t explain several features of cancer cells. For instance, by the time a tumour has formed it will probably have thousands of mutations; different ones in different cells in the same tumour. The spontaneous mutation rate is far too slow to generate that many. When the neighbourhood is healthy, the cells nestle tightly against each other like terraced houses and any hint of leakage from a cell or abnormal behaviour is quickly dealt with by the neighbours. In areas that are breaking down because of inflammation, poor nutrients, deficiencies in mineral and vitamins, cells lose touch with their neighbours, spew waste and grow uncontrollably. This, she believes is when cancer cells begin to spread. The big implication of this radical shift in thinking is that many of the things we know keep us on the healthy side of the street – cut down on sugar, exercise, stay a reasonable weight – have a direct effect on what is going on in the area surrounding cells that are turning cancerous. The message of this is hugely important – cancer is not just a disaster that happens to you, it thrives in conditions that you can do something about. So, the question becomes: Does it make sense to stop doing the thing that keep the neighbourhood healthy just because cancer has appeared? ‘We really should be able to control cancer as a chronic disease, like diabetes,’ Bissell told me when I spoke to her a couple of years ago. She’d recently done some studies with cancer cells in the lab which showed that those from a tumour in the breast could be returned to a healthy state by removing all sugar from their neighbourhood. Not definitive proof by any means but that is how all new ideas start. Another top scientist. who strongly agrees with Bissell about keeping cancer under control by ensuring the surrounding area is healthy is Professor Davies, of the Center for the Convergence of Physical Science and Cancer Biology at Arizona State University. In 2012 he was asked by the American National Institutes of Cancer to look at cancer through the eyes of a physicist since the search for a cure was going so slowly. In his 2015 his report he expanded on the idea that attributing all cancers to random mutations was implausible for several reasons. One is that mutations usually make the proteins and mechanisms they code for less effective, yet cancer cells are remarkably flexible and efficient. Quite apart from rapid growth, they can travel round the body and find new locations to settle in (metastasising). There they plug into a local blood supply and even maintain communication with the original tumour. Another is that if every tumour grew from a random mutation in a single cell in an individual body, you would expect tumours in different people to be very different and to behave in very different ways. But in fact, many tumours have similar abilities and patterns of behaviour. His recommendation was that that rather than trying to destroy the mutated cells it could be more effective to exploit the difference between a cancerous cell and a healthy one. And then, as Bissel advocates, to make conditions inside and outside cancer cells as healthy as possible to discourage cancer and slow its growth. So, Davies sketched out what an anti-cancer environment might be like. It began with the metabolic approach, targeting the fuel supply. Mitochondria, the power plants for healthy cells, get wholly or partially shut down in cancer. The result is that tumours can no longer use the combination of glucose and oxygen in the mitochondria that healthy cells use to produce the body’s energy molecule ATP. It’s a very efficient combination, turning one glucose molecules into 30 molecules of ATP. But cells have a back-up system, one that can use glucose with much less oxygen, which is what cancer cells use instead. It’s an ancient, far less efficient one – a single glucose molecule making just two of ATP – but it’s fast; good for rapid growth. This difference between cancer cells and healthy ones was first described in the 1920’s by the Nobel prize-winning German biochemist Otto Warburg . His theory was side-lined by the dramatic advances in genetics but found a new audience in 2015 with the publication of book which provided some solid figures to back up speculation that faulty genes could not be the only factor driving cancer. It told how data emerging from the latest American genetic screening program, – a 500-million-dollar project called The Cancer Genome Atlas (TCGA) launched in 2006 – has revealed that the gene changes within the cells of individual tumours are far more complicated and chaotic than anyone had anticipated. Good to see conventional medicine creep towards an ecological understanding of disease. In my opinion ecology should be the first science on the curriculum. I found that paragraph quite incredible! I knew about the metabolic theory of cancer, but I hadn’t realised that the conventional theory had been proven wrong! How could researchers ignore a clue like that – ensure it is replicable, of course, but to leave such a clue unexplored seems criminal to me.